Those punctual, hardworking Swiss have thought of everything. After all, where would we be without velcro, the World Wide Web (invented at CERN by British scientist Tim Berners-Lee) and… LSD? But there’s one thing you’ll never have to think about when it comes to travelling through their picture-perfect country: a hire car. Of course plenty of the population drive their fuel-efficient cars on their impeccably designed motorways but, for travellers, a car is about as useful as a pair of knitting needles on a Swiss Army knife. 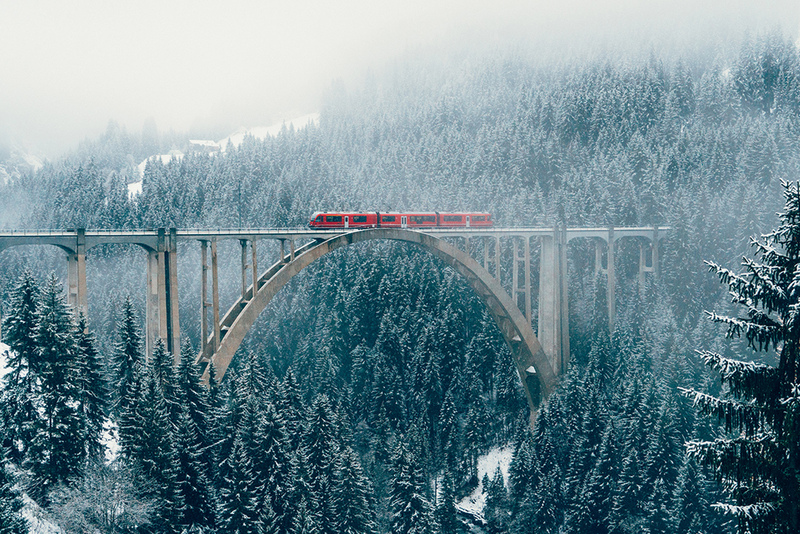 Although the country is compact – at around two-thirds the size of Tasmania – Switzerland’s public transport network is unrivalled, weaving a hyper-punctual web of rail, trails, river boats and buses across the land and requiring just one integrated pass: the Swiss Travel Pass. This is how you can keep your travels clean, green and lean while exploring Switzerland’s natural beauty by any means but car. Why drive when you can first-class train it? You’d be hard pressed to find a destination in Switzerland not serviced by a train – one with wrap-around panoramic windows and tea service, at that. There are 29,000 kilometres of public transport routes criss-crossing the country, and you can buy a blanket Swiss Travel Pass or individual region passes to make use of them, depending on where you’re going. If you’re just getting from A to B, you’ll truly understand the term ‘Swiss efficiency’ after touching down in Zurich and zipping to the other side of the country in two hours flat. However, for most people, it’s all about the Grand Train Tour of Switzerland – an experience in and of itself, which attracted a 48 per cent increase in bookings in 2017. It combines eight different routes, including iconic panoramic journeys like the Glacier Express (travelling across the Alps) and GoldenPass (with its beautiful Belle-Epoque GoldenPass Classic). With a Swiss Travel Pass in hand, you’re not only covered for train journeys but the entire network of boats, buses and city transportation, along with many mountain cable cars and free admission to more than 500 museums. Take a glimpse of beautiful Haslital. The circuit of the Tour de France may clock 3500 kilometres, but it’s Switzerland that has over 12,000 kilometres of signposted cycling trails, making it one of the most cycle-friendly countries in the world. They’re even shutting down roads so you can ride in the shadows of their snow-capped mountains. Select mountain passes will now be closed to motorists between May and September for Ride the Alps, a cycle series that allows cyclists to freely ride through the storybook landscape without fear or inconvenience of passing cars. But it’s not just the Swiss who are nuts for two-wheel transport – almost two million visitors to Switzerland will cycle during their holiday, with about 30 per cent opting for the ease of e-bikes. Companies like Rent a Bike allow you to pick up wheels in one spot and drop them in another. You’ll also find bike-storing facilities on public transport, and for the serious lycra-lovers, there are even bike hotels where you’ll find handy facilities like bike repair workshops, e-bike charging stations, and luggage transfer services. The stunning Lausanne in full view. There’s nothing more quintessentially Swiss than a hike throughout the day before retreating to a traditional fondue house for schnapps, rösti and raclette. However, there’s more to Switzerland’s culinary landscape than chalets of cheese. In Zurich, explore the up-and-coming Zurich-West quarter on foot with fellow foodies on the Zurich Food Tour and you’ll taste your way through some of the city’s top restaurants and try freshly brewed Zurich beer. Continue your explorations and you might stumble upon Max Chocolatier; the artisanal chocolate house, which has its flagship on the banks of the River Reuss in Lucerne, offers private chocolate tastings to learn about the origins of their cocoa and other natural ingredients. Wandering by foot is also the best way to discover the makers within Basel’s Markethalle (Market Hall), which operated as a local market from 1929 until 2004. After laying dormant for a decade, it was rejuvenated and re-opened in 2014 with a line-up of up-market food stalls and a weekly market on Saturdays. To avoid transport costs gobbling up a good chunk of your holiday budget, many major cities within Switzerland provide a discount card when staying in one of its hotels. You’ll generally receive unlimited access to the city’s public trains, buses and trams, but some cards include additional extras, which make the argument for leaving the car in the rental bay even stronger. The Basel Card, for example, gives holders so much more than free transport, such as access to free wi-fi at 17 spots around the city; 50 per cent off admissions to Basel Zoo; a two-hour sightseeing bus; a walking tour of old town; and scheduled river cruises. In Bern, airport transfers are thrown in. In Lausanne, the Transport Card also grants holders discounts at selected shops, theatres and museums.